First, second, and third person are ways of describing points of view. When we talk about ourselves, our opinions, and the things that happen to us, we generally speak in the first person. The biggest clue that a sentence is written in the first person is the use of first-person pronouns. In the first sentence of this paragraph, the pronouns appear in bold text. We, us, our,and ourselves are all first-person pronouns. Specifically, they are plural first-person pronouns. Singular first-person pronouns include I, me, my, mine and myself. Here’s a tip: Whether you’re writing an email, creating a presentation, or just sending a quick tweet, Grammarly can help! Try Grammarly’s app to make your writing cleaner and more impressive. Try Grammarly for free. I think I lost my wallet! I can’t find it anywhere! Oh, I could just kick myself! We could do ourselves a favor and make a reservation for our group. Many stories and novels are written in the first-person point of view. In this kind of narrative, you are inside a character’s head, watching the story unfold through that character’s eyes. The second-person point of view belongs to the person (or people) being addressed. This is the “you” perspective. Once again, the biggest indicator of the second person is the use of second-person pronouns: you, your, yours, yourself, yourselves. You can wait in here and make yourself at home. You should be proud of yourselves for finishing this enormous project! Stories and novels written in the second person exist, but they are much rarer than narratives written from a first- or third-person perspective. You are not the kind of guy who would be at a place like this at this time of the morning. But here you are, and you cannot say that the terrain is entirely unfamiliar, although the details are fuzzy. The third-person point of view belongs to the person (or people) being talked about. 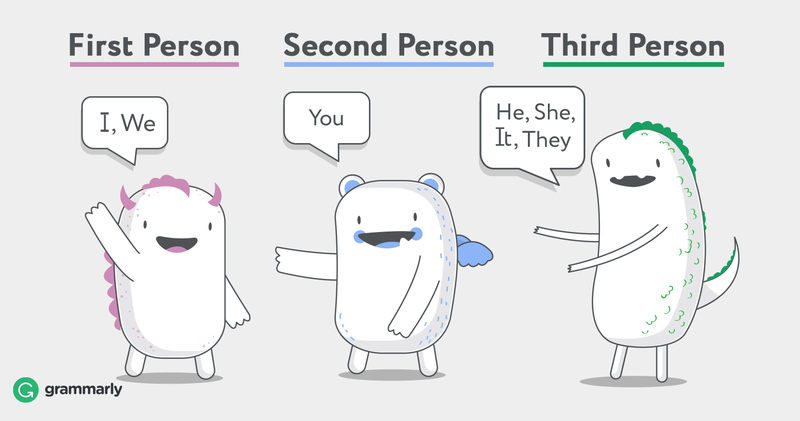 The third-person pronouns include he, him, his, himself, she, her, hers, herself, it, its, itself, they, them, their, theirs, and themselves. Tiffany used her prize money from the science fair to buy herself a new microscope. The concert goers roared their approval when they realized they’d be getting an encore. But if you look at this sentence and think “Mike isn’t me,” you can eliminate the first person. You can also think “I’m not talking to Mike,” so that eliminates the second person. You’re left with the third person. Plenty of stories and novels are written in the third person. In this type of story, a disembodied narrator describes what the characters do and what happens to them. You don’t see directly through a character’s eyes as you do in a first-person narrative, but often the narrator describes the main character’s thoughts and feelings about what’s going on. Sam Vimes sighed when he heard the scream, but he finished shaving before he did anything about it. Most of the time when people talk about themselves, they speak in the first person. It would certainly be eccentric to talk about yourself in the third person all the time, but you may do it once in a while for comedic effect or to grab someone’s attention. Tina: Let’s get sushi for lunch. It’s Jeff’s favorite! Tom: No, Jeff hates sushi. I think he’d rather get burritos. Jeff: Um, does Jeff get a vote?